Brooklyn-based design collective Thwart Design—also behind 2005's Design Without Reach—has just launched Tools for Dying, "a site that makes good design accessible for the dead," poking fun at DWR's soon-to-openTools for Living stores in Santa Monica and NYC. 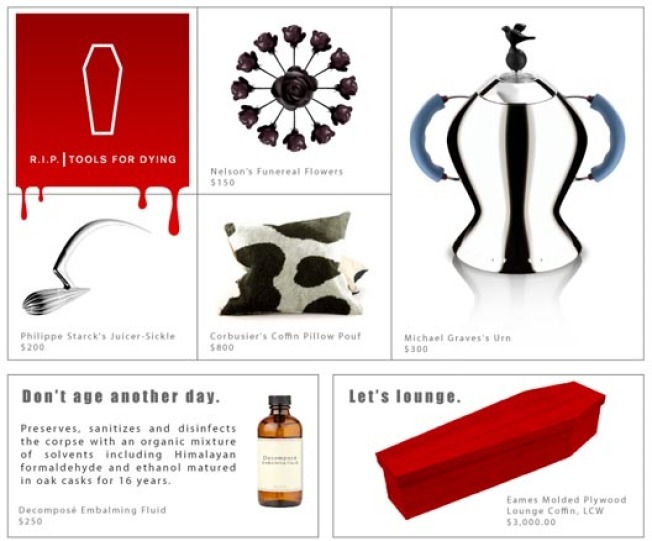 Macabre highlights include Eames Plywood Lounge Coffin ($3,000), Nelson's Funereal Flowers ($150), Michael Graves's Urn ($300), Corbusier's Coffin Pillow Pouf ($800), and the particularly disturbing Philippe Starck's Juicer Sickle ($200). Whether it was intended or not, it also speaks to the ridiculousness of the industry of death. People may go into debt for an Eames Lounge Chair, but they also go into debt for the right casket, which is likely not nearly as well-designed as this hypothetical Lounge Coffin.